Bottom up – groups of end-users decide to invest in the deployment of a network. Public involvement is limited to small grants or guaranteeing loans to facilitate demand aggregation and/or access to ducts. The UK government is to set up a rural ‘Community Broadband Fund’ which will be used to help provide opportunities to rural communities such as the upland areas to apply for funding for community broadband projects. £20m of funding will be made available through the Rural Development Programme for England (RDPE) and Broadband Deliver UK (BDUK) to help small communities develop ideas for broadband services into a working solution that can get people online. The RDPE programme is set to run until 2013, and it is through this that funding will be granted. 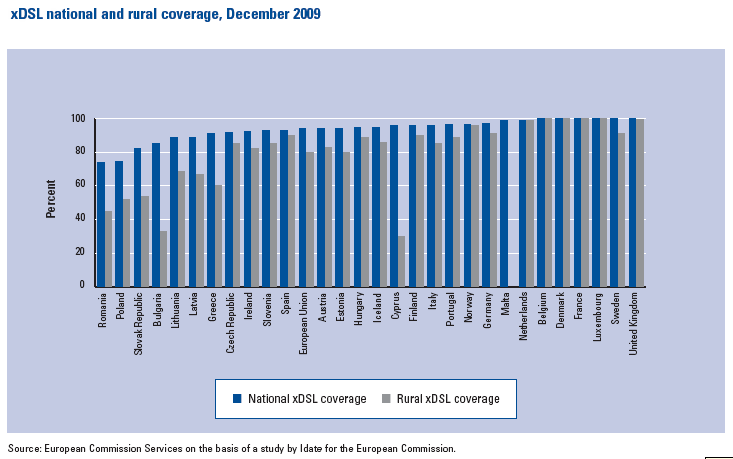 “Fast reliable broadband is one of the biggest problems that many rural areas face. Local communities have long been setting up their own schemes in the face of apparent indifference from BT and a sometimes patchy response from the public sector. The Uplands Policy Review rightly points out these initiatives are a valuable part of the broadband picture and £20m for community initiatives is welcome [but] is a comparatively small amount when compared to the scale of the rural broadband problem, so it needs to be carefully focused. Last month the Commons environment and audit committee recommended that bringing faster broadband to farmerswould help them run their business and encourage young people to stay involved, whilst also helping to keep these vital communities running which are a great aid to our tourism industry.Rural areas such as the upland areas fall under the ‘final-third’ category which private firms are unwilling to provide broadband to due to the high cost of investing there and low return that would be seen. Subsidies are needed to get things moving and it is great to see that some money is being funnelled this way. BDUK has £530m to spend in this parliament to help broadband roll-outs, with some of this money already allocated to pilots or as grants to local authorities. Any investment specifically focused towards rural areas will help bridge the broadband divide and help ensure that the final-third do not get left behind whilst the rest of the country sees next-generation broadband coming to fruition. Presentations from the Bottom-up Broadband initiative workshop in DG INFSO on 7 March have been uploaded here . Please have a look and comment if needed. If you are involved in a bottom up initiative or see this model as the best approach tell us why and what you are experiencing? We applied to the rural broadband initiative fund in the uk but found it is not very easy to get help from Defra, especially when county councils apply for the same pot/area. I don’t see many communities getting any money for innovative projects, but I see many working with the incumbent to provide faster broadband in exchange areas. I don’t see any upland farmers getting connected. Its early days, so we shall live in hope that some of the money ends up where it was intended to.